Do fear and anxiety prevent you from regular dental visits? Do you dread sitting in the dental chair? Studies show that apprehension about visiting the dentist is prevalent. In fact, 30% of the population evades the dentist out of fear or anxiety. In Utah County, oral conscious sedation now offers a safe solution for stress-free, comfortable dental care through a simple pill that works simultaneously as a sedative and anti-anxiety medication. While staying awake and in control, you can now walk away from a dental appointment without any painful memories, thanks to sedation dentistry. 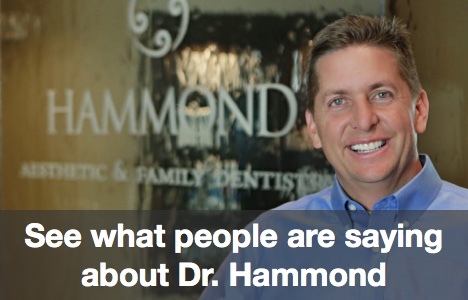 When Dr. Hammond was interviewed by Randy Alvarez on The Wellness Hour, he spoke about a case wherein a patient requested sedation dentistry when she received porcelain veneers. Dr Hammond was able to give her a beautiful smile while she was under dental sedation. In addition to dental sedation, we do all we can in our Provo cosmetic and sedation dentistry office to create a five-star VIP experience that will leave you feeling pampered, comfortable, and relaxed in the dentist chair. From our heated neck support pillows and back massage padded chairs, to our freshly baked bread and melt-in-your-mouth chocolate chip cookies, we create a relaxing, secure atmosphere that will alleviate your apprehensions as you walk in the door. However, for many, sedation dentistry adds an extra level of relaxation that puts them at ease. Initial consultation. At our initial consultation it is important that you communicate your past medical history, any current medications, and your anxiety level so that we can pick the oral medication best suited for your situation. Higher levels of anxiety require stronger medication. Oral medication. Depending on your circumstances, you will take a pill either the night before or an hour before the dental visit to help you relax prior to the procedure. Local anesthetic. While dental sedation lowers your anxiety level and consequently heightens your pain tolerance, it does not work as a painkiller. Depending on the dental procedure(s) performed, a local anesthetic may be necessary after the dental sedation takes place. During procedure. Throughout the dental treatment your protective reflexes, breathing, and circulation are unaffected by the dental sedation. You might feel slightly groggy, but relaxed and unconcerned about the dental procedure. As a safeguard we measure your vital signs regularly. Transportation. Due to possible drowsiness, it is important to have someone drive you to and from your dental appointment following dental sedation to ensure safety. Recovery. You should feel completely normal within 24 hours of your appointment. While side effects of oral conscious sedation are minimal, some report dry mouth, hiccups, or nausea. Safety. Oral conscious sedation is considered quite safe because your natural reflexes still operate normally in case of an emergency. Freedom from stress. Because you can still respond verbally while sedated, you can communicate any pain that you may feel. The dental sedation creates an amnesic effect so that you don’t remember much about the appointment after you leave. Comfort. For those who normally struggle with a bad neck or back, oral conscious sedation helps relax your muscles so you can comfortably sit in the dental chair. It reduces tension associated with anxiety during the procedure and soreness afterward. Pain reduction. Studies show that a higher level of anxiety lowers pain tolerance. Since sedation dentistry reduces your anxiety level, you won’t be as sensitive to pain. Quality. This dental sedation treatment increases the quality of dental care because we can work more effectively on your mouth when you are calm and still. IV sedation. This type of sedation is similar in function and strength to oral conscious sedation, except that the medication is injected intravenously. It generally takes effect faster and is suggested for shorter appointments and patients that don’t have a fear of needles. Inhalation sedation. Laughing gas is a light dental sedation option provides minimal anxiety reduction and a higher level of painkiller. It is administered through a nose mask. To conquer your fears of the dentist through oral conscious sedation and start on the pathway towards a revitalized smile, contact our Provo, Utah sedation dentistry office here or fill in the simple form on this page to schedule an initial consultation if you are in Orem or Utah County. For more information about our sedation options, please feel free to visit our dental sedation website!